Pattern recognition is an incredible skill that we mostly do without even noticing. Pattern recognition is not the same as pattern matching. Pattern matching dictates that what we are looking for is either here or not. Pattern recognition has the flexibility to recognize that what has happened before may happen again in a similar way. The magic happens when the pattern breaks, and it means something. Interpreting broken precedent enters the realm of art. 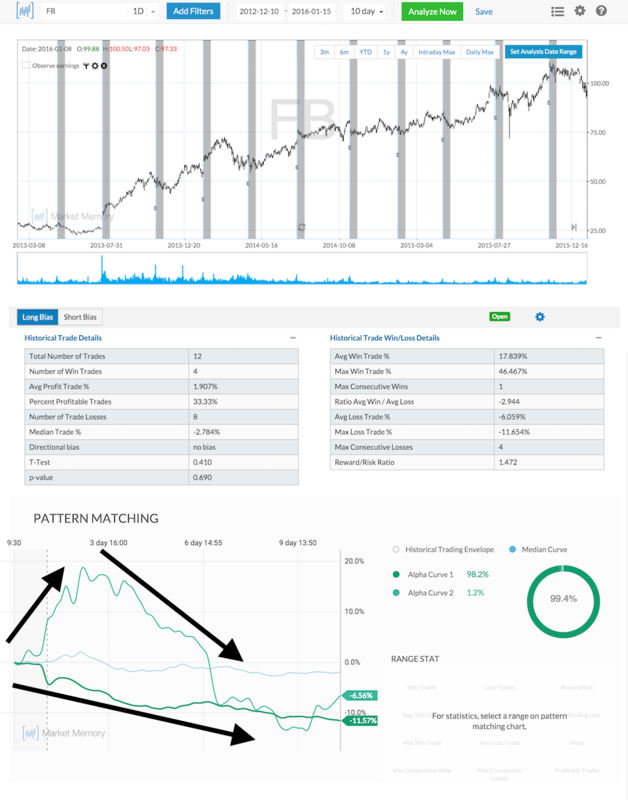 $FB just had earnings, and if we look back at all the resulting fluctuations after it released earnings in the past, it has followed a couple of very distinct patterns. Below are the two most common patterns the stock trades in the ten days after an earnings announcement. Our Market Memory pattern matching algorithms has identified them clearly. In plain English, the most dominant pattern for $FB is to sell off after an earnings announcement. $FB is a high growth company, and anticipation is always high. It makes sense that speculators and investors might be slightly disappointed in the short term with the reality of *actual* results. The second most dominant pattern is for $FB to pop up immediately after an earnings announcement and then give back all those gains. As the market unfolds, the move is powerful, and it initially looks like this time may be different — then $FB conforms to the expectation of the second most dominant pattern. Good for us, the product clearly works well. If you follow pattern matching to a ‘t,’ you’ll miss 100% of the game-changing opportunities. So, it’s critical to allow the flexibility of pattern recognition — so the big opportunities can make themselves known to you. While the interpretation of these outliers is an art, it makes logical sense as well. The most common outcomes, by definition, will have the low to average returns because they are common. The rareest outcomes tend to have incredible returns because they are in fact, rare. This is basic risk/reward. Here are some of those powerful uncommon patterns in $FB history. Good luck out there. If there’s any way I can help, please send me a message. Here’s the exact query I used to get the results for this post.